Dr. Gustafson received a B.S.E. in 1993 from Duke University, majoring in Electrical Engineering and Mechanical Engineering and Materials Science. He continued on at Duke to earn his M.S. (1998) and Ph.D. (1999) in Mechanical Engineering and Materials Science. He received his appointment as Assistant Professor of the Practice of Electrical & Computer Engineering in 2005 and was promoted to Associate Professor of the Practice in 2009. 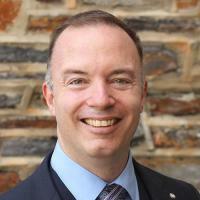 Previously, he has served as Adjunct Assistant Professor of Mechanical Engineering and Materials Science and as Lecturing Fellow and Assistant Chair of the Civil and Environmental Engineering Department, both at Duke. He also holds a secondary appointment with the Mechanical Engineering and Materials Science Department. Professor Gustafson's primary focus is on undergraduate curriculum and laboratory development. He is responsible for the first-year Computational Methods in Engineering (EGR 103L) course required for all Pratt students, but has also taught seventeen other courses totaling over 70 course offerings and over 5000 students. He previously served as a Lieutenant Commander in the United States Navy as a Naval Reservist, and is authorized to wear the Navy and Marine Corps Commendation Medal (two awards), the Navy and Marine Corps Achievement Medal (two awards), the National Defense Service Medal (two awards), and the Military Outstanding Volunteer Service Medal.